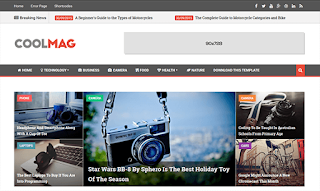 Cool Mag Blogger Template is a clean, simple and easy-to-use news & magazine blogger templates that is built for you to create your own pages exactly as you want. In addition, Cool Mag free blogger templates is easily usable with any mobile devices like tablet, mobile phone or larger screens without removing any content. Thank You Very Much Admin for Sharing.